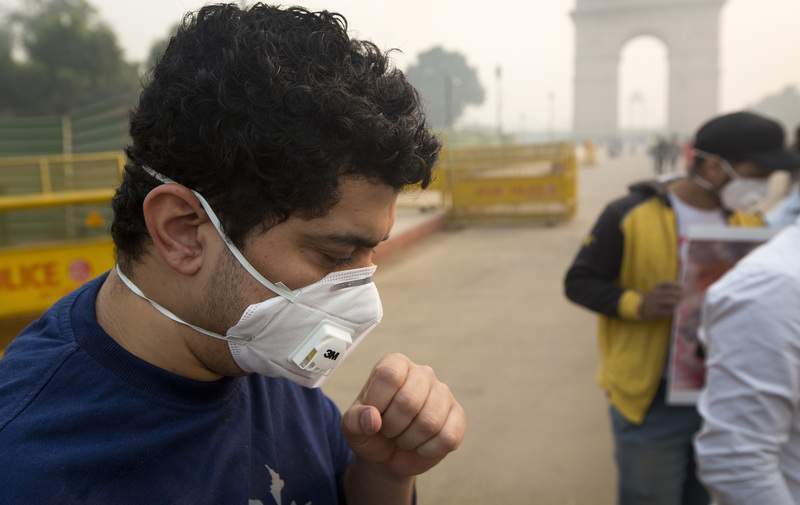 Associated Press An Indian man coughs Thursday after the festival of Diwali in New Delhi. Fireworks increased air pollution from 200 to 681 in one day. MEXICO CITY – Central American migrants in a caravan that has stopped in Mexico City demanded buses Thursday to take them to the U.S. border, saying it is too cold and dangerous to continue walking and hitchhiking. Mexico City authorities say that of the 4,841 registered migrants receiving shelter in a sports complex, 1,726 are under the age of 18, including 310 children under 5. “We need buses to continue traveling,” said Milton Benitez, a caravan coordinator. Benitez noted that it would be colder in northern Mexico and it wasn't safe for the migrants to continue along highways, where drug cartels frequently operate. The Mexican government has said most of the migrants have refused offers to stay in Mexico, and only a small number have agreed to return to their home countries. The U.S. Federal Aviation Administration issued an emergency airworthiness directive on how to handle erroneous data from a sensor that investigators believe malfunctioned on a new Boeing jet that plunged into the sea in Indonesia, killing all 189 people on board. The number of refugees and migrants from Venezuela has risen to 3 million, the United Nations said Thursday. The U.N. refugee agency and the U.N. migration agency said 2.4 million Venezuelan refugees and migrants are in Latin America and the Caribbean and the rest are in other regions. Citing data from national immigration authorities and other sources, the agencies said Colombia has the highest number of refugees and migrants from Venezuela, with over 1 million. . The European Union expects Serbia and Kosovo to “swiftly deliver” on their commitment to talks on normalizing relations, which is the key for the two nations to advance toward membership in the bloc, the EU's foreign policy chief said Thursday. Federica Mogherini met with the presidents of Serbia and Kosovo as part of an EU-mediated dialogue that is designed to solve their decadeslong dispute, which has threatened the stability of the Balkans. Kosovo declared independence from Serbia in 2008, but Belgrade does not recognize the move. Toxic smog shrouded New Delhi as air quality plummeted to hazardous levels Thursday after tens of thousands of people set off a multitude of firecrackers to celebrate the major Hindu festival of Diwali. Pollution levels shot up to 681, as reported by the U.S. Embassy on Thursday, from 200 a day earlier.